Given by Madame Tussaud's Ltd. This panel belonged to a set of ecclesiastical ornaments used during Christian ceremonies. In the language of the Church, the colours and the imagery of this object were appropriate for funeral services. The skull and crossbones, a well-established symbol, dramatically reminded the congregation of the transitory nature of life. They appeared on grave stones, monuments and paintings as well as in textiles. During the Counter-Reformation from the second half of the 16th century, the Catholic Church encouraged the revitalisation of the arts and in particular their role in arousing intense emotion. Different media were used publicly to produce awe and fervour among the faithful during church services, including funerals. Rigid apparel of embroidered brownish red silk velvet bordered with a band of yellow silk satin (1 inch in width), and edged with a narrow black and brown silk braid. The red velvet bears a strong image created through the application of silk satin and couched cord: a skull and cross-bones dominates the centre of the panel and is surrounded by decorative scrollwork. The applique white satin is tinted or painted in black and grey on the skull and elsewhere in blue and red. The applique of yellow satin in blue (which creates areas of green). 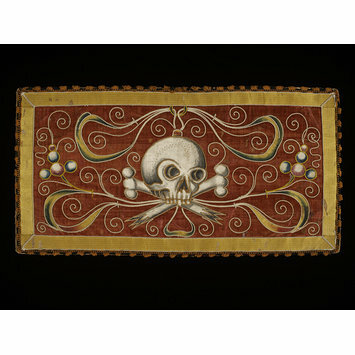 The applique satin is outlined in a couched yellow and white cord, and certain elements of the design are emphasised by the use of a similar couched outline, such as the teeth on the skull. In the centre of the skull there are needle or pin holes that suggest it may have been stitched to something at one point (they form a zig zag shape). Drips of, possibly, candle wax have dried on the surface of the panel. The panel is backed with coarse undyed, probably, linen in a plain weave, and possibly glued to the silk (to go by the rigidity of the piece) although a few stray thread ends on the back suggest that some of the stitching was executed after the linen was put in place. Historical significance: This panel is significant as an example of the impact of the Council of Trent (1545-63) on the design of church ornaments. While the Council's impact on sculpture and painting is well covered in existing literature on the plastic arts, its interpretation in textiles has largely remained hidden within specialist textile histories. This divorce of textiles from the larger picture is unfortunate as priestly appearance was part of the ceremonial around those other more durable objects, and part of the experience of the faithful. It seems likely that panels from dalmatics may have survived intact longer than other parts of the dalmatic which may have become damaged during church services or been recycled at a later date. Similarly, the wear and tear on chalice covers was probably less severe than on other church textiles. The dried wax on the surface of the panel is an important component of its history, probably revealing the panel's use in the vicinity of candles, a crucial component of church services, and a serious danger to the well-being of the any materials with which they came into contact. Attribution of date and place based on strength of Counter-Reformation in Spain and similarity with surviving examples in Segovia Cathedral and Murcia. Original attribution by Donald King in 1967 when he identified the object for Madame Tussaud's - he gave no justification for his attribution. Attribution note: Vestments tend to be made to commission, even if their motifs are often taken from a standard vocabulary of motifs. This object belonged to a set of church ornaments, probably fulfilling the function of a panel on a dalmatic (the priestly garment worn by deacons). 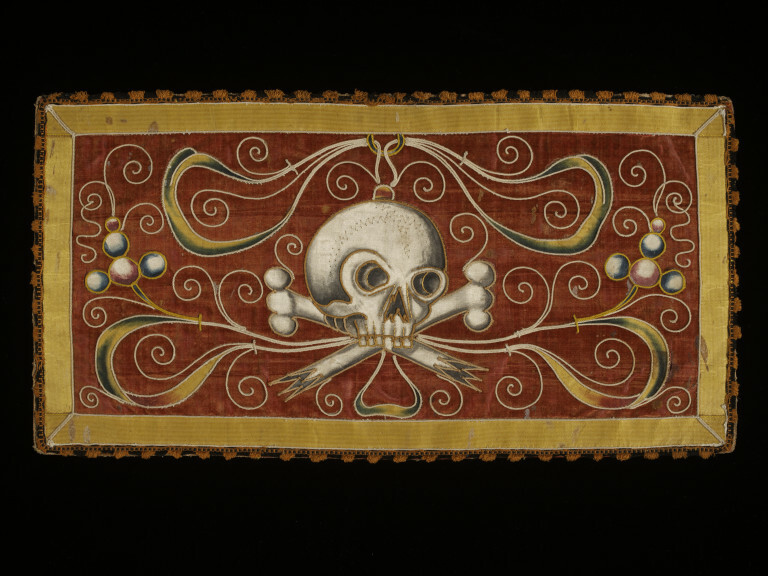 It is one of a set of matching ecclesiastical embroideries whose colour and imagery were appropriate for the liturgy of the dead and were therefore used at funerals. The Spanish style of dalmatic had matching apparels on the front, back and sleeves, those on the body being substantially larger (squarer) than those on the sleeves (rectangles). Usually, those on the body of the garment were attached between the waist and the hemline, those on the sleeves towards the edge with the imagery clearly visible when the arm was at rest by the wearer's side. (Pauline Johnstone. High Fashion in the Church. Leeds: Maney, 2002, p.142). The other panels in the collection that arrived with this panel and match it in design, seem to be two for the body of a dalmatic and two for the sleeves. They would probably have been attached to a garment of some variety of black silk (possibly velvet). Our own collection has a sixteenth century funerary dalmatic intact, with its panels in the correct position (T.766.1919). The creation of embroidery and the learning of embroidery skills followed a similar path to that of sculpture and painting, and recently serious research has begun on its professional development in certain local centres in Spain (e.g. Marta Laguardia's work on Salamanca). Basically, skills were learnt through apprenticeship in a guild and groups of objects were made according to similar specifications (e.g. the workshop of the sculptor Gregorio Fernandez or that of the painter Francisco Zurbaran). Successful execution of standard imagery was valued (where today 'creativity' and 'originality' are highly prized). In some cases, embroidery was learnt in convents and nuns were skilled needlewomen who could make church ornaments. Apparel of embroidered silk velvet applied with silk satin, probably made in Spain, 1600-1650.